Can you check to make sure your firewall or security software isn't blocking Oculus/Facebook servers? The same question on my oculus,hope to fix it. 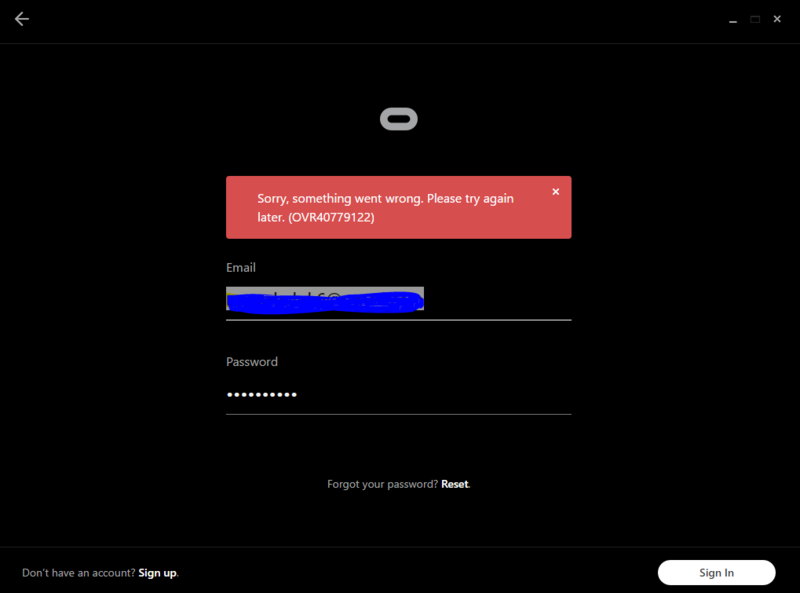 The same question on my oculus,hope to solve it. I am having the same problem. I have tried to reinstall and deleting all the temp files. Also gave it all the rights and took the firewall off for a bit, but all the time the same error code. Service logs give these error notes. Sorry, I'm not sure. Please submit a support ticket. Thanks. Any way to connect directly to internet? cant sign in as well. I fixed my problem(OVR40779122) by changing the DNS as 8.8.8.8. Just FYI, if you're using Bullguard, for some reason the Email monitoring service blocks my access on oculus. Disable the email monitoring service in services.msc and then go task manager > Details tab > find Bullguard filtering.exe process and end task. Then try closing and reopening Oculus app. I have to do this every time i use oculus.